The M150 Monster model by Millennium Treestands is one of the most popular in its class, but that should not come as a surprise given the many benefits it can offer to hunters. It is comfortable, easy to carry from one tree to the next, and it has been made with durable materials. We will detail all of the most important features of this option below so that you can make up your mind about whether you need to consider it or not. We decided to start with this particular aspect because it can either make or break a stand. 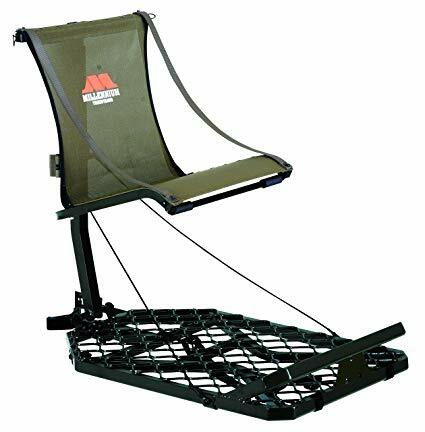 Probably the most significant advantage of the Millennium Treestands M150 Monster is its design since it boasts a mesh seat that stretches so as to hold your weight, while still remaining rigid enough. It has been designed to be ergonomic, and you can even customize its height as per your physical attributes and personal preferences. You can also adjust the height of the seat and even flip it up so as to take standing shots. That is a feature you won’t find in many other hang-on tree stands, and it’s quite important especially for bowhunters. The product offers you plenty of room to maneuver your weapon, and since the platform that it has been equipped with measures 24 inches in width and 37 inches in depth, you won’t have any difficulty with wide stances, especially if the seat is flipped up. The platform is somewhat wider compared to many other products that we have come across, so you can comfortably stretch out your legs when you have been sitting in the same position for too long. The product is even outfitted with a foot rest, and that’s another benefit to mull over. It goes without saying that you aren’t interested in spending your money on a tree stand that doesn’t last you for as many hunting seasons as possible. Well, you’ll be happy to know that this particular one boasts an all-steel construction. Its flat-fold design makes it easily transportable, and the thing to write home about is its welded steel construction. There is nothing to worry about with regard to durability. We would also like to add that we haven’t come across any complaints regarding rust with this product, and that’s all thanks to its powder coat finish. The M150 is a bit heavier compared to some of the other hang-on tree stands we have analyzed to bring you this information. Weighing in at 19.5 pounds, it’s certainly a little hefty compared to some of its competitors, especially those that don’t come with a seat with a backrest. However, if you are focused on comfort and you want to spend a whole day out hunting, this product is undoubtedly worth giving a try. You will be glad to know that this unit accommodates hunters and their gear that weigh up to 300 pounds. That makes it pretty convenient and versatile, but it doesn’t necessarily mean that you should carry more gear with you since the tree stand can hold it. Keep your equipment as light as possible for maximum movability. An aspect that does make this unit easily transportable is the fact that it comes with backpack straps that are built in the structure of the stand. The build and the overall design of this product should give you the reassurance you need when you’re sitting on a tree. We would like to add that it comes with a harness, but that the latter does not include the carabiners. However, the safety rope with the special knot does come with one carabiner. 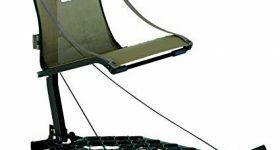 The two ratchet straps are described by other hunters that have used this unit before as being thick and good quality, so definitely different from the cheap thin straps you might get with other tree stands in the same category. Many users say that they feel rather safe while they are sitting in it, so that’s something else you ought to consider. Since the product is not accompanied by a climber, you could use climbing sticks but you have to make sure that you utilize a safety belt. All in all, this comfortable model should last you for a long time and should even enhance your hunting performance due to its features.